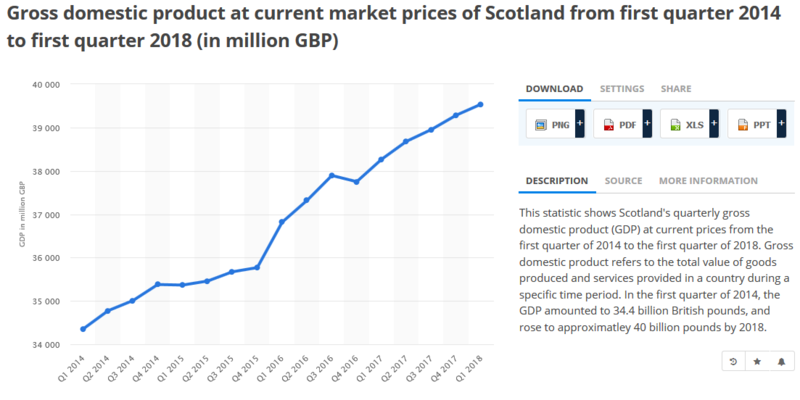 This graph from Statista shows Scottish GDP climbing steadily from £34.4 billion in 2014 to £40 billion by mid-2018. That is a 13.99% increase in less than four years. Inflation has stayed low over this period, so the graph suggests a robust economy despite the political constraints on it. Off Topic but still on matters financial. According to Tom Gordon in the Herald Jezza has pulled the plug on Kezia in terms of further Labour party funding for her court case with Stu Campbell of Wings. Apparently Kezia’s costs to date are running at approx. £100,000 (borne entirely by labour party) and Corbyn has insisted ‘nae mair’. (Not surprising since the entire court case could have been avoided by Kezia issuing a public apology and a reasonable donation to a charity of Stu’s choice). Ah well Kez, what a tangled web we weave…. According to Tom Gordon’s piece Labour didn’t even tell Kezia – they merely contacted her lawyer direct. (Wow – Jezza can play hardball when he wants!). Herald speculates whether Daily Record will pick up tab but suggests won’t cover any costs and damages if Stu wins the action. Good to hear Kezia may have to pay her own way. Carefull John , your expecting a positive report coming from BBC Scotland on anything Scottish, now you know that ‘s not allowed ! Reporting Scotland a bit positive tonight. I don’t believe you John when you say the BBC aren’t doing it on purpose, and it’s all subconscious. It will take a lot of convincing and irrefutable proof to get me to believe that. Apparently our idiocy of a parliament (Scottish) have yet again voted for the most unpopular version of their idiocy. It’s about time Holyrood started giving me proof that their decisions are well founded. They are making things up out of thin air then voting for it. Is there a way I can make a vote of no confidence? For the parliament; but full confidence for the Scottish government? Any ideas where I would start? If MSPs are going to start down this route of complete ignorance (ignoring popular opinion, voting to the detriment of society) purely to show how ‘powerless’ the SNP are – it’s just the latest propaganda extravaganza obviously, but it isn’t just party politics when they are not only ignoring us, but are trying to change laws and policies that could be making a Scotland a better place. Will it stop after independence even? I want the opportunity to put in a no confidence vote – maybe that’s how we should decide on when to have an election in future, have a confidence poll once a year, if everything is fine, carry on, otherwise call an election. We don’t need another GE, we need a Scottish Parliament vote, I am sick of the dimwits that swan about Holyrood, we need better choice and rid of half of them. Here’s my idea for a new political structure. We only have council elections, but each council is made up of 3 tiers, your usual councillors, your council representatives in parliament (MSPs) and your council minister (specialising in something) – you just straight up vote for 3 different people, one for each category. Then your council must sit with all members, your triumvirate of MSPs coordinate between council and parliament, and your minister makes up the part of government. So each council has equal representation, and you get closer ties between local and national government, and your government is made up of people specifically voted into that position (and not just because they were in the winning party). Hmm. Maybe I shouldn’t have drunk that tequila. Still, I have no confidence in the (non SNP) MSPs now. And I want rid of that list system, what an atrocious idea. And I would like this all sorted by the morning please. I haven’t got the proof. I give up. No, wait, didn’t I say that it is probably often conscious and deliberate at senior/editorial level but the lesser ones are ‘working toward the Fuhrer’ so to speak, not needing to think about what they’re doing, just knowing the seniors will like it? New structure – a bit like the USA with senators locally elected but sitting nationally? What about Plato? Only philosophers decide. I’ve been philosophical at times. Hmm, yeah, I’ve seen hierarchal pressure working, it is quite astounding how much people seek approval from bosses, at the expense of personal opinion and principle, then the bosses think they are all powerful because everyone agrees with them and can’t handle any kind of dissent, however benign. I dunno, I find people awfy difficult to fathom. Crowd psychology is a fascinating subject, but I’m about 30 years out of date with any knowledge on it. I think I lack whatever it is that most people have to enable immersion in the crowd, lots of people just make me feel uncomfortable. Not sure I want to emulate any American system, think I will withdraw my suggested new political system, I was drunk after all. I’m a bit wary of crowd immersion too, even panicky at times. Social media suits me. Wish it had been around when i was an even more anxious youngster. You’re out-of-date? I used a Hitler reference! Hey Contrary – can the rest of us get a wee taste of that Tequila? Had to read again to find the Tequila reference. Is that an upper? Maybe stick to the whisky? Since President Trump is slapping tariffs on everything and building a wall to keep anything Mexican out, there will be plenty of tequila sloshing around the world market. Well, Ludo, I didn’t feel drunk at all – which is the most scary part, so you are better off not touching the stuff, because you begin to believe you are the most creative, fabulous person ever. And it was down in Newcastle, got sent off on a training course there, so south of the border, dinnae want to be venturing there. Though I do like Newcastle immensely I have to say, and in fact usually go to England for my hols (I’ll be off to Cornwall soon! That’s nearly abroad). Luckily I’m getting sent back next week because I’ve still got another 28 varieties of tequila to try (I only tried 3 already mind you, so not sure how I’ll fit in 28). Alasdair’s ‘Tequila Theory’ is , without doubt, the most positive spin that has yet been achieved for Pres. Trump’s policies. Were I a White House apparatchik I’d have Alasdair on the payroll instanta. When you’re heading down to Cornwall mind and Pass The Duchy on The Left Hand Side!